Chinese New Year Celebrated in Style! I don’t know if Chinese New Year has passed you by, but for us at playgroup, it has expanded to cover two weeks! 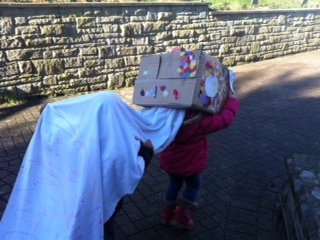 During and after our Friday mud kitchen session, a dragon was created and enjoyed for hours by the playgroup kids. 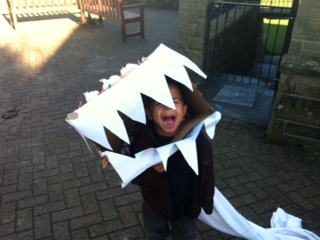 The dragon took centre stage at lunch, during outside play and in the story. As I look back over the delights of this week at playgroup – chinese dragon-creating, baking melting moments, tackling mini assault courses, Candlemas at Grindleford church, stick sculptures at Forest School – I am struck by the array of opportunities our children have. Your children also afford us so many opportunities for growth and development, all in the name of childcare, dragons included!